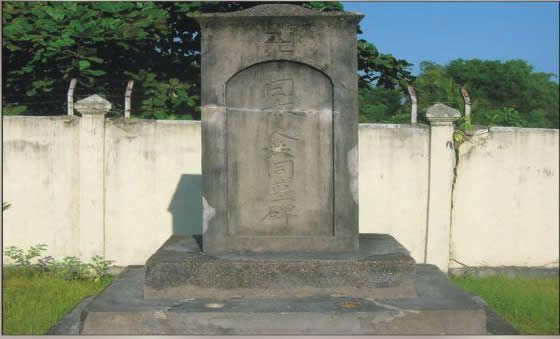 Tugu Perabuhan Jepang or can be called Japanese funeral monument is located on Markoni street Gg.III with a distance of 4 km from the downtown of Tarakan, North Kalimantan. This monument is a witness to history of presence of the Japanese people that is a rectangular flat is equipped with writing kanji. Tugu Perabuhan Jepang has building of height 2 m, width 50 cm piece essentially made of three tiers is equipped with 2 small hole diameter of 5 cm, there is a writing kanji found on the front left side of the monument. This square building as a funeral ashes of Japanese people who died. Tugu Perabuhan Jepang monument was built in 1933, this is evidence of the early history of arrival of the Japanese in Tarakan City that possibility as a trader and subsequent expansion of Tarakan made in the eastern part of Indonesia the Japanese army during World War II.